Dental hygiene students attended from Cape Cod Community College, MCPHS University, Forsyth School of Dental Hygiene, Middlesex Community College, Mount Ida College, Mount Wachusett Community College, Quinsigamond Community College and Springfield Technical Community College. Yes, I stand here before you as the president of MDHA. Just like you I am able to stand at the state house because of our professional association. I also stand before you as an educator in the profession of dental hygiene, clinician practicing for 32 years in the commonwealth, and lifelong resident of the commonwealth. For the students graduating this year, remember that ADHA is your professional association that supports you and protects your profession. I would also like to thank our lobbyist, Charles Glick and his associates Kate Saville and Charlotte Boghossian , as they continue to help us advance our profession, this would not be happening without their help. I would also like to thank Jeremy Crandall from the Pew Charitable Trust for all of their support! Also a special thanks to Quinsigamond Community College for bringing their portable dental chairs to assist with the dental screenings, and students from Cape Cod Community College for providing the dental screenings. Thank you also to our District I Trustee Peter Gangi for being here. No matter where we have traveled from ….We stand here together as one unity …with many voices. Today marks a special day in the year for the profession of dental hygiene. This special day is reserved for you to have an opportunity to provide your voice for the profession and more importantly for the residents of the Commonwealth. Your voice Counts for Residents who are seeking oral health care by a dental professional and for those seeking oral health care and are experiencing challenges accessing dental care. Dental hygienists and dental hygiene students are committed to providing quality oral health care to the residents of the Commonwealth and your presence here today reflect this. 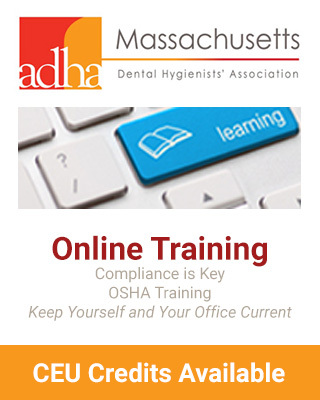 S.1238/H.1185 – Nitrous Oxide bill – This legislation would enable dental hygienists who have obtained a special permit and have undergone necessary training to administer nitrous oxide. S.611/H.2221 – Medicaid Reimbursements and oral health access. Make oral health care accessible to ALL Residents of the Commonwealth. S.1165/H.613 – Third party payer Bill – would allow public health dental hygienists to directly bill private insurance companies in addition to Mass Health. S.1169/H.474 – Dental Therapist- This bill would recognize specially trained hygienists as midlevel dental practitioners to provide comprehensive and affordable oral healthcare to the residents of the Commonwealth. We all see patient’s struggles with dental care or hear stories such as this story from a young girl (age 30) in severe tooth pain rushing to an emergency room only to be given a Rx because she has an abscess and a RX that she cannot afford to fill or a middle aged woman eats baby food or places her food in a blender so that she can eat because she does not have the funds to pay for dentures/bone grafts needed. Where did these people try to seek dental care?? These stories occurred in the city of Boston in the year 2018. In the city of Worcester 2018, a young boy age 26 lost his job and he asked the doctor to remove his braces only to be told that it would cost $600.00 to remove them. After two years, he still has his braces on his teeth embarrassed to ask for help. Unfortunately, we all have heard too many stories of people struggling to obtain oral health care even starting already in the year of 2018. Let your voices be heard for the profession of dental hygiene and for the residents of the commonwealth so deserving of quality oral health care. ! 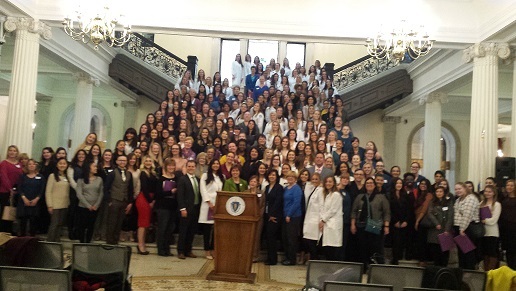 Welcome Everyone to Lobby Day for Dental Hygiene! Thank you for your time and commitment in participating in this special day.